I would first like to acknowledge our Dear Lord and Savior Jesus Christ. To him be all glory and praise, now and forevermore. Our God is a healing God and His desire is that we all prosper and be in good health. On January 4, I asked for an early leave from work, so that I could go home to prepare myself for the annual staff party. I departed work at 6 pm that day. Up until 8 pm, I was still in town, talking with a few friends at a local beauty salon. I really wanted to leave, but every time I said I would in a few minutes, I did not. I finally decided to leave. So, I walked out the shop and bid everyone farewell. As I crossed the road from the gated complex, I saw a lady sitting down crying with her cell phone to her ear. I thought that maybe someone close to her had died and she had just received the sad news. But there was something inside of me telling me to stop. I believe it was the Holy Spirit, that still, small voice. So I stopped and asked her if she is okay. She replied saying that it was her heart. I asked her where was her family. At this point, she disclosed to me that she is not from the parish and she was not reaching anyone on her mobile. I really felt it for her. I could tell that she was in such great pain, because of her facial expression. I thought to myself that I could call someone to come and help her, but my phone was out of credit! I then beckoned to a young man I saw across the road but, to my surprise, he didn’t even answer my call for help. I prefer to think he did not hear me instead of casting judgment and so I will give him the benefit of the doubt. I then dialed the only source I know because I was in shock. I really thought this lady was having a cardiac arrest (heart attack). I asked the lady if I could pray for her, and she said yes. I prayed for her in the name of Jesus and I used my God-given authority, and commanded the pain to go, in Jesus’ name. I know God would do something and I told Him, He can’t allow this lady to die. The power of God came and did something in her and she stopped crying. I then asked her if she is a Christian and she said no. I shared the gospel of Jesus with her and the message of the Kingdom. She accepted our Lord and Savior that night and, no doubt, heaven rejoiced. She later disclose to me that the doctor told her that a piece of fat was growing around her heart and she had been having pain for sometime now. I prayed for her another time and the pain left. However, her heart was flattering a bit. All I had to do was believe! I did not want to leave until everything was back to normal. But then I decided that I had to go. Jesus was doing the healing not me . All I had to do was believe. I contacted her some 22 days later, and she is doing well. I saw her yesterday and she said everything is good. I let her know that God did it. I am believing God that when she goes for another appointment that the doctors will be surprised. So much so, that they will have a desire to know our Lord and Savior Jesus Christ. I encourage you to go into all the world and do what Jesus did. God bless you and I pray even now that if you are sick and reading this, I command your body to be healed in Jesus Name. Amen. 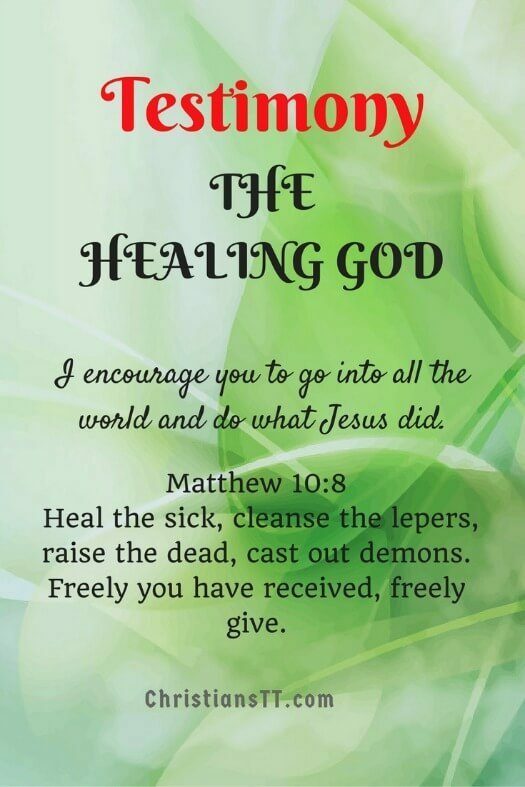 Matthew 10:8 – Heal the sick, cleanse the lepers, raise the dead,[a] cast out demons. Freely you have received, freely give. Proverbs 11:30 –The fruit of the righteous is a tree of life, And he who wins souls is wise. I praise You my dear Heavenly Father.I thank you for Your loving kindness and Your mercies are new every morning. Dear Lord,please help me to increase my faith believe in You with all my heart,and live by faith. Our God is a healing God,and His desire is that we all prosper and be in good health. We believe that the power of God will heal all of us,if we believe in God the Father Almighty,with all our heart. And we all are saved by the precious blood of Jesus,and by His stripes we are healed. Glory be to the Most High… for He is love… And His Love endures forever. Amen! Please pray for me and my husband so we can have a house of our own. For to day is the day that the Lord has made.We shall rejoice and be glad it. I have no words to say again. Thank you so much.In the Holy Name of Jesus Chrish. Amen. Amen. Let the prayer of God be realised in my life. Thank you Kashmere…for your loving article and thank you so much for your little prayer at the end about anyone needing healing….I bless you for it because it means so much to me. Yvonne Marie Miller. London, England. God to be the Glory. God is with us indeed and lives in us. The Bible say pray in truth and in spirit. If you feel praying for someone or that someone ask for prayer Pray immediately, it means God is speaking with us. In 2008 I was at working night shift and while I was in duty with the routine, one of the patient ask to pray for him. This guy his friend had a fight with someone and he was helping his friend only to find out he will be injured badly to his eye and admitted in the hospital for eye surgery. Night before operation he asked for prayer from myself. After ward routine I pray for him and while praying I felt the power of Holly Spirit. In the morning before I knock off I prepare patient to theater and knock off to home. I don’t know what happened during the day, when I came back to work, one of the day staff asked me what did I do to that patient because operation was cancelled and was discharged during the day, and the patient left a message to me thanking me for my prayers. Oooh Jesus, I thank you for your power. I magnify your name, Glory to Jesus. Ameeeen. God Bless you Jeanette……your humble prayers went right to the heart of our Loving and Healing God…and God is Faithful. God bless you my dear for your Compassion and Empathy. Yvonne Marie Miller. London, England. Love this testimony, there are so many things l can identify with, l am also being used by god to share his good news, give god all the praise!